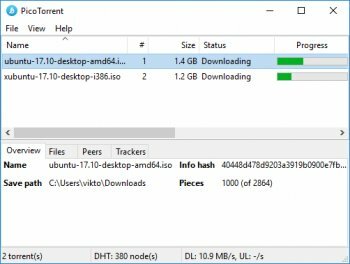 PicoTorrent is designed to be a tiny, easy-to-use BitTorrent client with low memory usage. 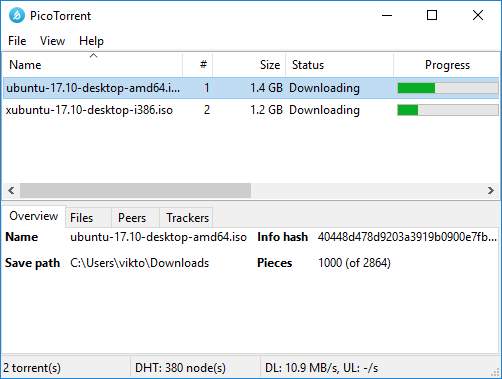 We made PicoTorrent to go back to the basics of what is needed from a BitTorrent client. No ads, carefully selected features, and a native user interface integrating seamlessly with your desktop. PicoTorrent is built directly on the Windows APIs which means that it is native looking on all Windows versions. We designed it to be as simple as possible to use, and all torrent controls are hidden in context menus. Very neat and simple. Not too many options which I never needed anyway! Very light on resources as well. Love it! Thanks to the developer. Very simple, and easy to use.... Like the other one used to be:) Thank you!! !